Fresh contemporary design and a club-style atmosphere make the Moorpark Hotel unlike any other. This hip boutique hotel in San Jose features dozens of unique and tailored details that reflect the cosmopolitan quest of the hotel’s designers to offer chic, elegantly playful surroundings that are ideal for everyone from corporate travelers to leisure guests. The best part about the Moorpark Hotel is that it offers fantastic accommodations at very reasonable prices, allowing guests to indulge in a luxurious Silicon Valley hotel without breaking their banks, and providing a great value for weekend travelers in need of a classy getaway. The Moorpark Hotel is drenched in style and fashionable attitude. Unique features like the billiards loft, the cabana-flanked heated pool and hot tub, the executive business center and the spacious fitness facility make this hotel truly stand out. For anyone who wants to mix their business with their leisure, the poolside cabanas feature complimentary high-speed Internet access; wireless Internet access is available throughout the hotel. Mornings are saluted with complimentary hot breakfast buffets that include everything from sinfully delicious bacon and sausage to exotic treats like Japanese-style white rice and hot miso soup with tofu. For lunch and dinner, guests can visit the on-site Park Bar & Grill Restaurant, which serves delicious, traditional American comfort-food fare in a stylish and relaxed setting that opens to the sun-washed courtyard. The beautiful guestrooms feature luxuries like natural stone bathrooms, cozy bathrobes and Egyptian cotton linens, and are flawlessly appointed with rich mahogany furnishings and softly elegant hues of crimson and butter cream. There are also a variety of executive amenities, such as two-line phones with voicemail, T1 Internet access, spacious writing desks and DVD/CD players. 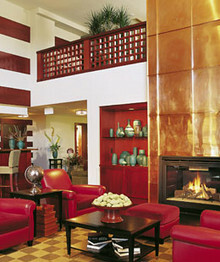 The Moorpark Hotel also features a VIP Club Level for guests who are seeking a little added luxury. The guestrooms on the VIP Club Level include all of the same amenities as the traditional guestrooms, as well as plush slippers, vanity mirrors, morning newspaper delivery, VIP Club kits, turndown service and express checkout. The Moorpark Hotel in San Jose is an excellent choice for exciting weekend stays. With dozens of breathtaking golf courses, outstanding mountain wineries, pampering day spas, a vibrant restaurant scene and tons of hot nightlife destinations, Silicon Valley truly offers something to everyone. Not only is the Moorpark central to all of the most popular attractions and businesses in San Jose, it is also just minutes from the world-class shopping and upscale atmosphere of Santana Row. “The Row” is one of Silicon Valley’s newest gems, offering cozy wine and tequila bars, open air lounges, sensational restaurants and high-end designer shops all on one beautifully landscaped, fashionably picturesque street. The Moorpark Hotel is easily accessible from the Bay Area’s major freeways, including 280, 85 and 17, so guests will have no trouble exploring the city and quickly getting from one place to the next. San Jose's boutique hotel, The Moorpark, features a contemporary clubby design, highlighted by neo-traditional stylings and tailored details such as mahogonay furnishings, natural stone bathrooms, and Egyptian cotten linens.